I was looking around today and saw an ad for stoptech BBK for my LCI 550i. I looked at it and it was ~$3400 for the fronts, complete kit. I did some more shopping and found a set on clearance for $1800 in silver or black (probably get the black). I think these are "ST60" 6 piston calipers. Also how about rotors? The kit lists them as 380x35mm (some places like ECS call out 380x32mm for the F10 BBK). Do you replace the entire thing or just the outer disks? Any estimates on cost or where can I find the part numbers to shop for replacement disks? Last edited by Luky; 04-14-2019 at 09:53 AM. 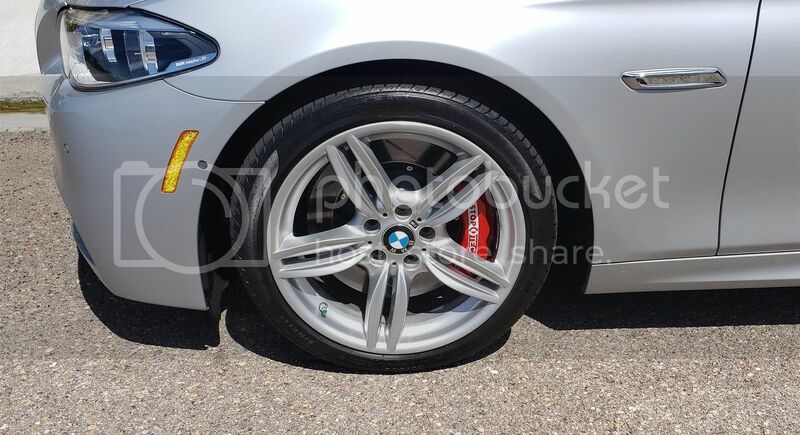 So I contacted John Butler (the business proprietor) at Buybrakes.com as I really wanted Red calipers if I was paying for a BBK. 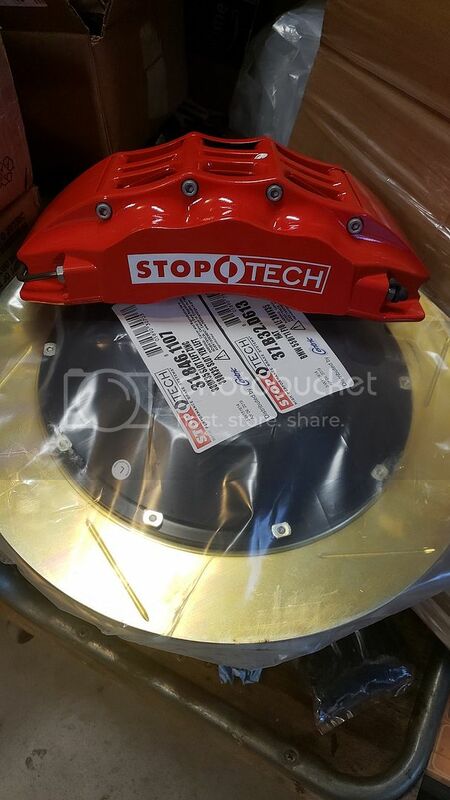 They contacted Stoptech (apparently they are a very large distributor for Stoptech) and I guess they had a "partial" kit and agreed to manufacture another red caliper and provide it for the overstock sale price of $1800. This is like half price! I was able to get an awesome deal and John was great to speak with (another enthusiast). He said they still have one black BBK and one silver BBK for BMW F10 remaining at this sale price if anyone is interested. Try contacting him through their website buybrakes.com. I just sent a text inquiry to 702-903-1713 to get started. I am not affiliated with them in any way, just thought I would share what seems to be a great deal... (He said the M3 BBK sets all sold out the first day of the sale). I already received the order confirmation email and he said it should be about 3 weeks to complete the kit and ship it. Sounds great! Post pics after install. StopTech is made by Centric, and they are local. If I am not mistaken, their HQ is in Industry, CA. I have StopTech rotors. No complaints. They are holding well. Guess what I got today? 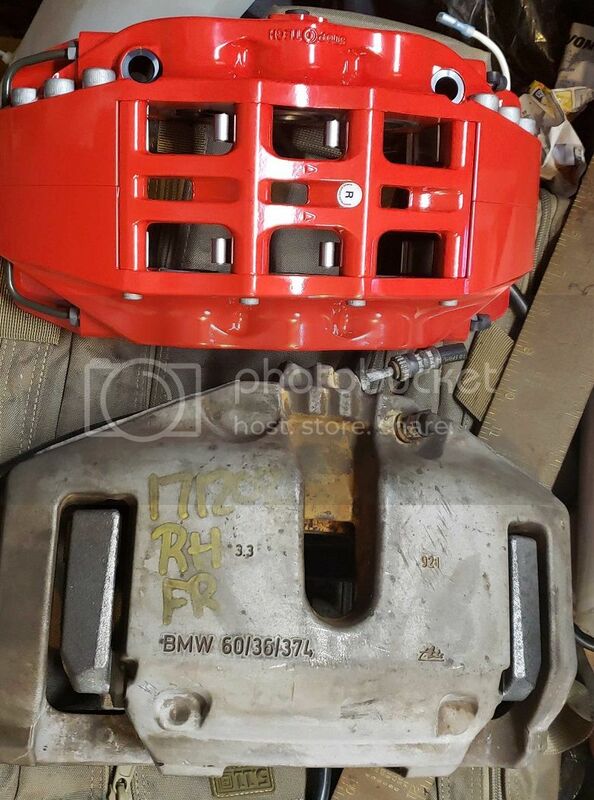 I have a pair of calipers from a 760Li (same as 550i calipers but with taller caliper carrier to use bigger pads on 374x36mm rotors; this is the euro 550i "high speed brakes" set upI was going to do). They weigh 17.4lbs each vs the Stoptech calipers at 10.2 lbs each (with bracket). Will have to wait until I pull the stock rotors to see the weight difference there. Last edited by Luky; 04-12-2019 at 12:38 AM. What a nice looking setup and not that expensive considering you're getting an entire kit (caliper, rotor and pads) that actually fit the car. Assuming that the caliper is aluminum, it will be much lighter than the stock setup. I recently changed pads and rotors on my 535d and was amazed at how heavy the stock front caliper and forged carrier seem to be. It was difficult holding the caliper (with one hand) while securing it a suspension part before removing the carrier. Hopefully, we'll see photos of the end result soonest. BTW, are existing brake line compatible with new calipers and will the kit require new, larger wheels due clearance issues? I always use a short ~12" bungee to hang the calipers from the spring. Just rest it on top of the rotor/strut while doing the bungee. I looked at the suggested website and found your brake kit. In looking at the list of BMW's intended for the kit, it mention a 535d but no 535d xdrive. As my brake pads and rotors and calipers appear the same as those of a 535i xdrive, I am assuming my car was mistakenly omitted from the list. Nevertheless, you got a great close-out deal relative to the list price. Also, with this kit available, why would anyone fool with Russian adapters and M5 calipers? The Stop Tech's seem every bit as good. BTW, once you've completed the installation, could you estimate if the new calipers would clear 17 or 18 inch rims as well as the 19's. Buying new wheels and tires, in addition to the brake kit can be expensive. Got them installed today. No fit problems with the stock M-sport 19" wheels. How much ? And can you link me ? What happens to the OE front brake wear sensor? Did you just unplug it? Dang! You went all out! Looks great! 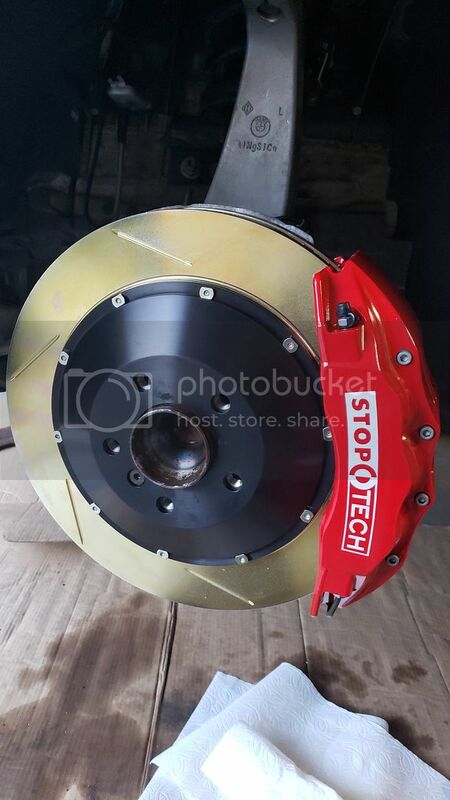 Relative to the performance of the OE brakes, how do you rate the StopTechs?